A Glittered Guide for Whimsical Crafting! Andrews McMeel Publishing, 9781449414528, 208pp. With gorgeous full-color photos and step-by-step instructions for making 20 whimsical Halloween crafts—including some never-before-published Glitterville favorites—Glitterville’s Handmade Halloween is the go-to guide for America’s second-biggest retail holiday. Celebrate the season of costumes and candy with Glitterville's guide to creating a wondrously wacky and whimsical holiday! Treat yourself to the kookiest compilation of crafts and decor assembled from Glitterville's creator, Stephen Brown, judge of Craft Wars on TLC. Glitterville's Handmade Halloween is full of bright, colorful photos, step-by-step holiday how-tos, and over-the-harvest-moon decorating ideas to make your home sparkle and shine this spooktacular season. 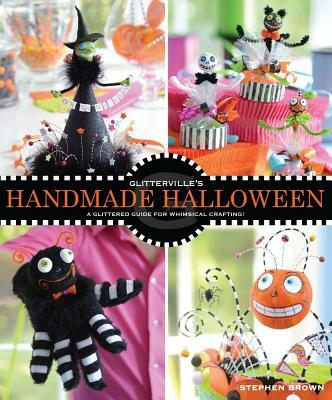 A great book for intermediate to experienced crafters, Glitterville's Handmade Halloween will delight readers as they make their way through the playfully photographed pages of the book, which include full, never-before-published instructions for making some of Glitterville's most sought-after items, including Halloween candy garland and the studio collection of folk figures. As a boy, crafts and decorating guru Stephen Brown found himself in post-holiday doldrums after every big celebration, but he learned that through crafting for the next upcoming occasion he could turn those feelings around and "make every day a holiday!" After working as a costume designer for television and film, Stephen launched Glitterville, his successful line of giftware and home decor products that has been featured in Mary Engelbreit's Home Companion, Southern Living, Country Living, and numerous other publications. When he's not crafting, Stephen is traveling the globe producing new Glitterville products.